Rye is becoming increasingly popular, and I certainly understand why. It's flavorsome, affordable and has a bit more punch than your average bourbon. Rittenhouse from Heaven Hill is an old classic and a good starting point to explore rye. The nose is unmistakably spicy with loads of cinnamon, cloves and caramelized sugar. Gingerbread, sweet oranges and hints of floral add to the complexity. After a strong and gingery arrival, the taste develops more aromatic and dry, with notes of bitter honey, mint and wood spices lingering in the medium finish. A steal! Good rye all-rounder. Rye spices, sweetness, maybe a bit too much oak on my taste but giving overall good impression. The price is not bad too. Rather decent rye whiskey. There are some spices, a bit of wood, but also some cooked vegetables in here. The spices you get are five spice, cinnamon, coriander and garam masala. With some water there is also caramel in the nose. Decent, a little bite of the alcohol. You also get the spices as described, again with some cooked cabbage. Medium length. Quite some caramel and vanilla in the finish. It gets a bit woody, but not really anything annoying. Sober and decent. I like Bottled in Bond as a statement and 100 proof is also good! look interesting, and a very good PLV. I'm buying. Spicy, clear tart note, ginger, scorched oak, vanilla, caramel, orange peel. mouth-filling, sweet and slightly sour, then directly the oak, vanilla, ginger, orange and something slightly metallic. medium, it leaves the oak with a sour ginger-orange note, and something like cocoa powder 90%. A beautiful Rye both pure and in a Manhattan very much. In addition, in my opinion good value for money. Spicy, ginger bread, sourdough, charred oak, candied ginger, some vanilla and orange peel. Oily, mild despite 50% vol., Oak, light tannins, vanilla, fresh ginger, white pepper and some orange blossom. Long, warm, ginger, vanilla, oak and dark, unsweetened cocoa. If you have never been introduced to rye whiskeys, then this would be be a perfect first encounter. I can not give him the 90 points today, which certainly goes hand in hand with a different "level of experience". But it's still my favorite Rye in the budget class. 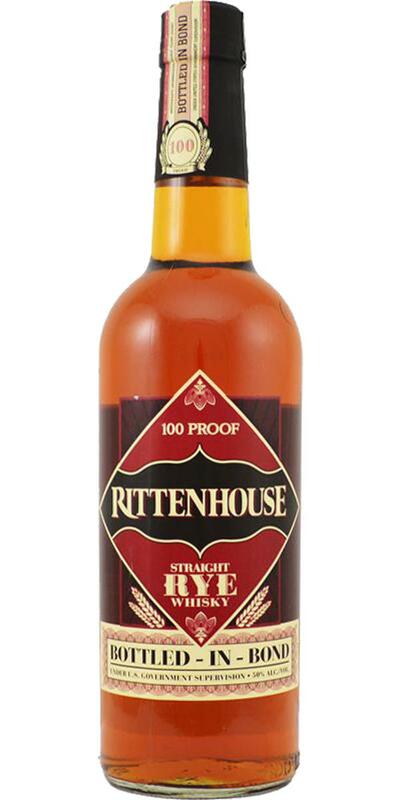 I had the Rittenhoues Rye a few years ago, another bottling and was thrilled. There were no notes, but I still remember pronounced pine needles notes. Let's see. The spicy pine needle are still in the nose, but also a great, vanilla sweetness as a counterpoint. Over time, the oak flavors with nutmeg and cloves spread, a spicy fruity rye note remains in the background. strong onset, pepper, a slightly acidic oak notes, very spicy, a little bit of bitterness and some menthol. Menthol turns into a nice toffee sweetness, spices, pepper, grape seeds and tart oak notes. Might be a bit aggressive for some but it's got some interesting flavour to it. Quite aggressive. Spicy, very woody spice. Cloves, Cinnamon, Nutmeg. Vanilla. Sweet clementines. Canned fruit salad. Butterscotch. Some sultanas. The rum soaked raisins (those of you who pick the raisins out of rum-raisin ice cream know what I'm on about). A bit of musty book shop. Very lively citrus juice at first, oranges, clementines, also some peach. Then a hit of bitter wood and woody spices. Long. Waves of spice, then sweet, then spice, then sweet. When I burp it tastes like fanta.